Grand Prix motocross came to Mallory Park for the first time last weekend in front of 41,000 spectators, and the result was a universal success. The brand-new track hosted some great racing for the world’s best, and even the scheduled rain showers stayed away to keep the crowd happy. The British riders were up for it at their home race, although it didn’t quite work out for a British victory, but that’s to take nothing away from the spectacle. The first MX2 moto promised so much for the partisan crowd. 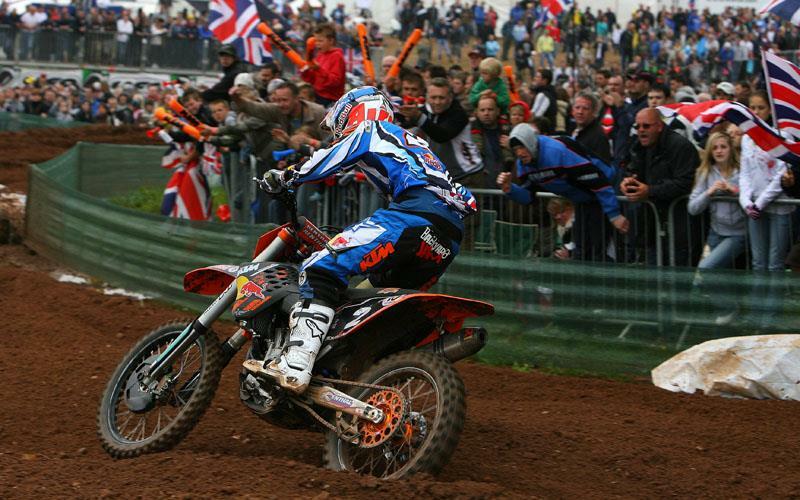 Tyla Rattray led from gate to flag, but he had Tommy Searle and Shaun Simpson for company. The British KTM duo battled briefly before Tommy started to edge a gap, trying to keep Tyla honest as Shaun slowly fell away into the clutches of Tony Cairoli, recovering after an average start. Tony made his way past Simpson and began to close in on Searle, making a pass that accidentally put Tommy briefly on his ear. This left Rattray and Cairoli clear out front, and the reigning champion put on a big charge to try and close down Rattray, but the South African just kept grinding out the laps and Cairoli ran out of time, crossing the line just a half second in arrears. Tommy and Shaun cruised home in fourth and fifth, whilst Stephen Sword recovered from both an average start and an early spectacular spill to take sixth. Moto two was just another episode of the Tony Cairoli Show as the number 222 Yamaha led from the start and was never headed, although Tommy Searle kept him in sight the whole race, refusing to allow Antonio the opportunity to relax. Simpson again started with Tommy, but although he could race there for a handful of laps, it seemed the Scot lacked the edge to stay with Searle’s factory Red Bull KTM. The man on the move, though, was Tyla Rattray, Searle’s team-mate came from a mile down to charge through the field for fourth behind Cairoli, Searle and an impressive Steven Frossard who had a breakthrough ride to hold third. Swordy grabbed onto Rattray’s tail and followed him through the pack for fifth with Simpson clinging on for seventh, the win went to Cairoli ahead of Rattray and Searle, with Simpson and Sword finishing fourth and fifth overall. The first MX1 moto was epic, Jonathan Barragan led Billy Mackenzie, Steve Ramon and Max Nagl off the start, and it seemed to bode well for a British win as the fans went wild. But within a couple of laps, Billy Mac had dropped the CAS Honda, remounting down the field as Barragan and Ramon started to size each other up as Nagl gave them a bit of space. It took a while, but Ramon finally made a move for the lead on half distance, but as it seemed like Ramon, the reigning Champion, might ease to victory, David Philippaerts began to show signs of closing up to join battle from a long way back. Within a lap, Philippaerts had eased his Monster Energy Yamaha past Barragan’s Silveraction KTM, and Belgian man-mountain Ken De Dycker also hove into view, demoting Barragan with another lap on the clock. The scene was set for Ramon, Philippaerts and De Dycker to battle in the closing stages. First Phili mounted an attack on Ramon then, when the Italian made a mistake, Big Ken launched his own assault on Philippaerts, taking second as the championship leader took a tumble as the two lap board came out. It seemed like Ramon had done just enough as they circulated one last time, but Keeno wasn’t done as he put in one final push on his Suzuki team mate and made a brilliant move with just a couple of turns to go for the lead, De Dycker throwing a euphoric nac-nac over the big tabletop before crossing the line for the win. Barragan did his best to turn moto two into a yawner. The Spaniard ran second behind Marc De Reuver in the early laps and, when De Reuver dropped his Martin Honda, Barragan took the opportunity with both hands, clearing off for the win, a last-lap minor spill threatening but failing to ruin the party. Once De Reuver had gone, it was Ramon who held second, but he hit reverse and backed his way through the field in the closing stages - instead, Philippaerts and Pourcel battled for second with Pourcel’s Kawasaki getting the nod, some consolation for the Frenchman after failing to finish race one. Billy Mackenzie came out swinging for race two, fighting from the start and taking fourth at the flag. It was a bad day, however, for Josh Coppins, with the pre-season favorite crossing the line in 27th on the first lap of both motos. Coppins is still lacking his blazing pace after his pre-season toe injury, the Kiwi could only take 11th overall.